Can you imagine how the tapestry of God would look like? Let me give you a peek-a-boo to those blissful destinations where the flowers dance to the tune of wind. The journey which I am going to unfold covers some spell caster trekking places which are celestial in terms of the sheer beauty they embrace and also veil some mystical stories about them. But I recommend that if you are not vaccinated against the travel bug, you may be infected to travel for life after visiting these amazing venues. Yessss, it is Valley of Flowers – Story Beyond Mountain and Mist. The valley of flowers is truly a “nature’s carpet”. A spellbound destination which will leave you speechless. It’s a life beyond life where your soul is at peace and a perfect gift that you can gift your eye to quench its thirst with the dew of beauty. Let’s unfold this nature’s carpet. Trekking towards the paradise on earth enveloped high in the western Himalayas, a UNESCO World Heritage Site, Nanda Devi valley of flowers, stirs emotions of thrill, charm and excitement. Your journey starts with the roaring voice of Pushpvati River which forewarns not to harm any of the species of flora it protects. Crossing the shivering bridge it feels like certainly, this bridge did something wayward that the river is still furious on it. Successfully, the bridge transfers the chills to the travellers crossing it. But soon all the fear vanishes in the beauty with which the valley of flowers welcomes. Various species of the flower stand just in front of you with full vigour and the delight you feel in seeing the shades of divinity is above all words. This picturesque landscape painted in green, yellow, pink and purple will hypnotise you in such a way that you even forget that eyes are meant to be winked. The more you walk into the valley, the more you are captivated. But stop! Stop right there. Do not dare to touch or harm any of the floras and faunas here as it is believed that the valley is the playground of fairies and Gods on our planet and the demigods called Achharis protect the valley. Still, as you know some people never listen, so those who try to taunt the deity are known to be exterminated in magical ways. Even there are instances of many people who are lost in the valley forever. They are known to be taken away by Achharis. Pheww! Quite frightening, but not for you and me, we are here to fall in love, the pure love. But then again as it is said the overdose of anything is a tough job to handle. So while you are lying in the lap of nature extending all the gratitude for the sight of life, nature in benevolence gives you a fragrance from all thousand flowers. This magnanimity enchants in such a way that few people faint in the valley of flowers. Some call Kaas Plateau as the Switzerland of western India. 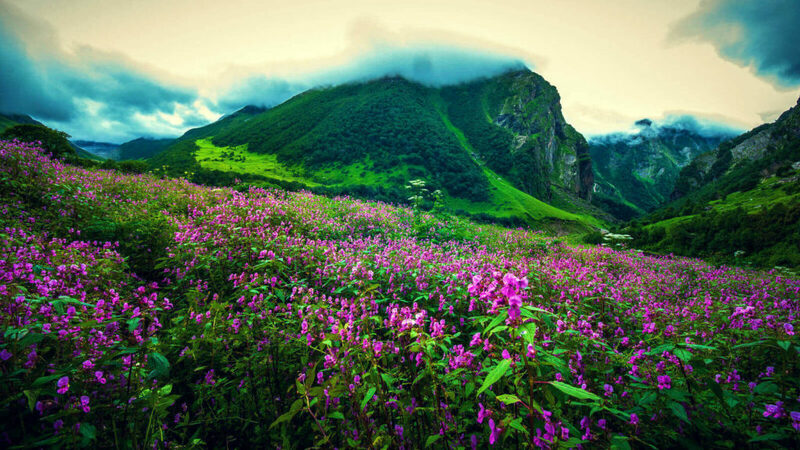 Why they call it so can only be known by visiting this valley of flowers in Maharashtra but for the glimpse of it just read along. Cradled on the land of volcanic eruptions, the plateau has approx. 850 varieties of plants amongst which about 600 are flowering plants and is located in Satara district. 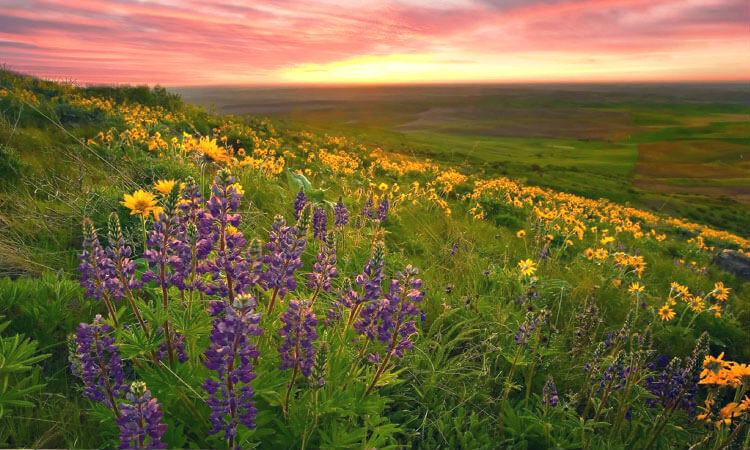 It is said that a new species of flower is seen every fortnight and the plateau changes colour each time. 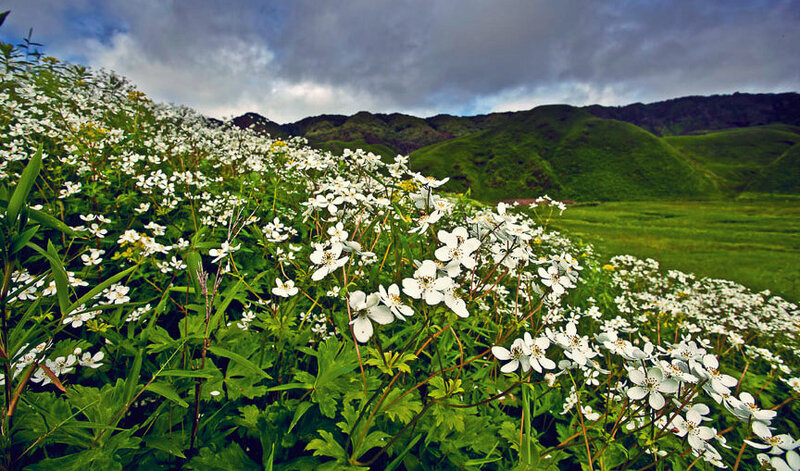 This valley of flowers has gained popularity after UNESCO declared it a biodiversity site. Your expedition to the plateau will be like going to heaven itself. The surreal view of the lush green landscape with beautiful strokes of pink, yellow, orange and purple will mesmerise you with the deific beauty. Every flower tells a tale which you may not understand but still, they will impress you with the story. Well! That’s the magic of nature. While Impatiens Lawii ensigns the plateau with a pink hue, Topli Karvi adds curiosity as it is only visible once in seven years and Kaas Lake is the souvenir. The insectivorous plants like Venus flytrap, Drosera Indica and Drosera burmannii which are ample in Kaas will be interesting for you to spot. Seeing the plant in action is not an everyday affair. The plateau would have been even more beautiful if the British wouldn’t have interfered and cut the part of it to convert into the tea plantation. As penance from nature for this snoopiness, many rare plants were lost forever. Like the border of the saree encloses the piece of fabric which has some supernatural peace, Dzukou Valley resting on the border of Nagaland and Manipur behind the Japfu peak also has some unique appeal. Pollution free air, untainted environs and the tranquil the Dzukou and Japfu rivers flowing across; you would be dumbstruck seeing the palette of beauty and peace served for you to savour. The valley seems to be the mirror image of utopia with flora and fauna still holding the virginity. The green panorama with one of the most beautiful versions of celestial colours by the rare flowers leaves you in awe while the stream tempts you to drink water instantly. Then don’t stop go ahead as the water in the stream is also believed to have magical healing properties. The place will spiritually intoxicate you by reinvigorating your every pore, every vein and every drop of blood. Fairies seem to have descended to the valley and taken the forms of flowers like lilies and wild rhododendrons. White elephants straight from our childhood stories have landed in this valley so if you are lucky you may sight them. Apart from all the beauty, there is a beastie fear-provoking story attached to the place. There is an attractive female spirit who subsists in the valley and takes a live male each year. Creepy! At least for me and male readers. In these valleys of flowers, it is hard to figure out whether you are in a dream or is this reality. Find the truth yourself but just remember that these valleys will only put a show between June and September. twice tried for flower valley but come back due to bad weather. After reading your post, am more keen to viist there.